Heed Audio Obelisk ps review | What Hi-Fi? 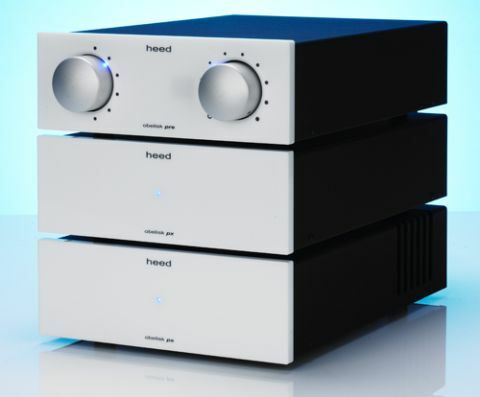 Until last year we knew Hungarian manufacturer Heed Audio as the company that makes some rather fine budget phono stages. Indeed the company’s Questar MM was a multiple Award winner a few years ago. The arrival of the Heed Obelisk si last year changed that impression. This unassuming 35 watt per channel integrated amplifier took on the establishment and, rather shockingly, won, in terms of performance at least. We were impressed enough to award it a Best Buy at its price point. This Heed Obelisk pre/ps pre/power combination is the natural step up from that terrific little integrated. The asking price almost triples once the preamp’s px outboard power supply is added to the equation, but there’s a lot more on offer here too. If you think these look like something of a throwback to the past, you’d be right. At heart, the electronic design of these components owes much to the amplification a small British company called Ion Systems made back in the 1980s. Heed took over the designs when Ion went out of business in the 1990s. In a rather satisfying ‘circle of life way’ it’s pleasing to know these newest components were redeveloped with the help of the original designer Richard Hay and updated for today’s market. The basic ideas behind the circuit design have remained unchanged but there have been plenty of revisions, particularly when it comes to component quality. The Obelisk ps stereo power amplifier is about as simple as these things normally are. In terms of connectivity there’s a single-ended stereo input and the ability to daisy chain amps to make bi-or tri-amping easy. The power amp is rated at 60 watts per channel into an 8ohm load and that output goes up to a reasonable 90 watts per channel as the speaker impedance halves. That’s just about enough for decent volume levels with most price-compatible speakers in all but the largest of rooms. If you crave party volume levels you’ll have to look elsewhere. Take a look inside and it’s easy to see the care taken over the circuit layouts, and the obvious quality of some of the components used. On the whole this power amp feels solid and able to withstand the rigours of regular use well. However, we think the finish could be slicker. The rounded-off corners of the front panel aren’t as smooth as we’d like and neither does this amp give off the aura of luxury that most similarly priced amplifiers manage with ease. In the Obelisk si integrated amplifier we didn’t mind this so much, but judged by sterner standards demanded at higher price points these Heed products seem a little ordinary. Start listening and any misgivings about the finer points of finish (where's that aura of luxury?) are pushed to the back of our minds. Everything we liked in the integrated’s sound is here, only better. The great thing about this power amp when combined with the Heed Obelisk preamp and px power supply is that it concentrates the listener’s mind squarely on the music, delivering it with real enthusiasm. This is because it gets the basics of hi-fi replay pretty much spot on. The tonal balance may not be wholly neutral. The bass is a touch on the rich side and the midrange is a little prominent, but the deviations aren’t massive enough to leave the amplifier sounding unbalanced. What they are is carefully balanced to deliver an appealingly full-bodied sound that delivers an awful lot of detail but never sounds overtly analytical. Vocals are impressively handled, sounding simply beautiful with great recordings such as The Unthanks’ Last. The group’s voices are reproduced with a lovely combination of solidity and subtlety. So capable are these Heeds with this lush production that it’s very hard pull away from the songs and concentrate on the sonic aspects of the presentation instead. The background instrumentation dovetails beautifully into the presentation and is delivered with just the right combination of finesse, and even power when required. Move onto something larger scale such as The Dark Knight Rises OST and it becomes clear that the power amp isn’t a powerhouse. There isn’t quite the sonic authority, bass tautness or image scale of some rivals. However, there are plenty of positives here too. This combo delivers rhythms in a resolutely surefooted manner conveying the momentum in the music in a class-leading manner. There’s a pleasing sense of composure too, with this trio keeping a firm hold of things as the music gets more complicated. More than the detail and timing it’s the way these Heeds deliver music, any music, with real enthusiasm that impresses. That’s not to say they add hype, rather they get straight to the point and make it very clear as to the emotions the artist wants you to feel. Rarely do we come across products that communicate this well. The Heed isn't flawless – we’d like more attention paid to the quality of the finish – and there are rivals that sound more authoritative. It’s these things that lose it that fifth star. However, the fact remains that this pre/power combination is great fun to listen to. It’s involving and exciting in a way few rivals can match, and that why this trio deserves a high place on any shortlist.